The rational selection of optimal solvents for a chemical process is a challenging problem in process design. The conventional procedure is to select a solvent during process development and to perform optimization of the solvent type afterwards. In integrated solvent and process design these two steps are performed simultaneously in order to account for the influence of the solvent structure on the performance of the entire production process in one single step. 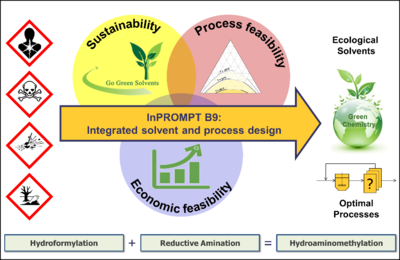 This, however, requires advanced solution strategies to solve large-scale mixed-integer problems (MINLP) resulting from model-based integrated solvent and process design. The objective function in process design is conventionally based exclusively on economic criteria. Important aspects regarding ecological aspects are often ignored. But for a process to be considered as “sustainable”, it should be optimized economically as well as ecologically.